The shoulder is the most mobile joint in the body, but with this increased mobility comes a greater risk of instability, when the head of the arm bone slips out of the shoulder socket. 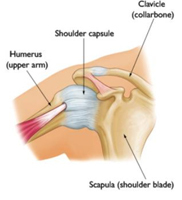 The shoulder joint: The glenohumeral joint (Ball-in-Socket joint) of the shoulder is comprised of the ball-like head of the humerus, or arm bone, and the glenoid, the socket in the scapula. The humeral head (ball) is larger than the glenoid (socket), similar to a golf ball and tee; this gives the greater range of motion in the shoulder. Stabilizing the joint:The glenohumeral joint is encased by the shoulder capsule, strong connective tissue, comprised of ligaments, which stabilizes the joint and keep the head of the humerus centered in the surface of the glenoid. Tendons and muscles which surround and attach near the joint all stabilize the joint. Direction of instability: Shoulder instability is usually in the anterior (out the front) direction, though in about 10% of individuals it may be posterior (out the back). In another 5-10% of cases shoulder instability may occur in more than one direction. This is called multidirectionalinstability. 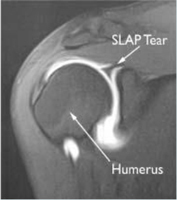 Shoulder instability occurs when the humeral head (ball) moves out of the glenoid (socket). This may occur as the result of a traumatic event such as a football tackle or a fall which may force the ball out of the socket. 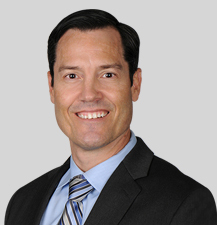 Instability may be a consequence of strain or repeated overhead motions, such as those in swimming, tennis, and volleyball, which stretch the ligaments in the shoulder allowing the ball to then move partially out of the socket. Increased looseness may be also be a result of normal anatomy. 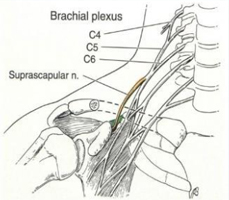 In rare cases, instability can occur without a history of trauma or strain. These cases generally result in multidirectional instability where the ball may slip out the front, out the back, or out the bottom of the shoulder socket. Symptoms of instability include pain, repeated dislocations, weakening or giving out in the shoulder, and persistent feeling of looseness as it the shoulder were slipping in and out of the joint or on the verge of doing so. Through physical examination,doctors can assess instability and test for general looseness in the ligaments. Diagnosis of injuries to the bone and soft tissue which may be underlying the instability can be made through X-raysand Magnetic Resonance Imaging (MRI), respectively. 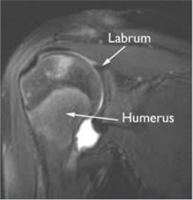 Magnetic Resonance Imaging done with contrast, showing an intact labrum (on the right) and a tear of the Superior Labrum, Anterior to Posterior (SLAP tear). Bankart lesion: When sufficient force is applied to the shoulder and a dislocation occurs one or more injuries must occur to the ligaments, cartilage, and labrum (which lines the edge of the glenoid or socket) in the shoulder. 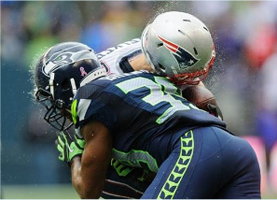 The most common injury is calleda “Bankart lesion.” This is a separation of the labrum from the edge of the socket. Bony injury: In some cases of severe injury, the edge of the socket may fracture or the attachment of the rotator cuff on the arm bone may pull off. 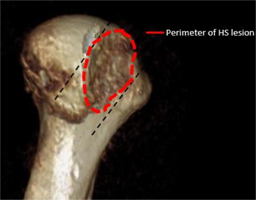 In the case of multiple recurrences of shoulder dislocation, there may be wearing down of the edge of the glenoid socket and development of a divot in the back of the humeral head (ball), called a Hill-Sachs (HS) lesion. 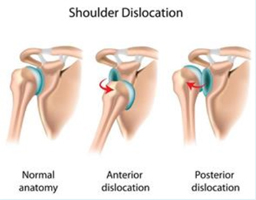 Acute Dislocation: The shoulder is immobilized in a sling for a period to allow the inflammation and pain to resolve. Return to sports is then possible; however, there is a significant risk of recurrent instability especially in young male athletes. 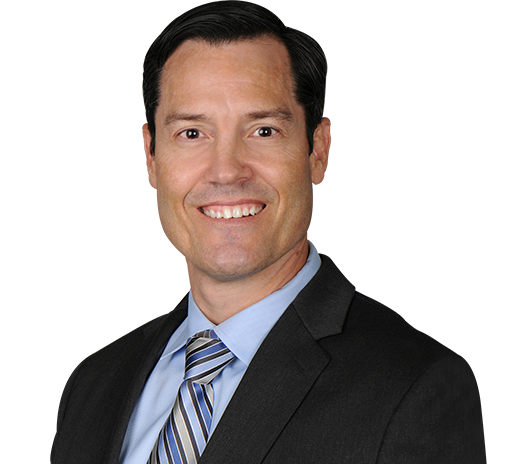 Arthroscopic surgery: In the absence of a bony injury, the goal of surgery is to restore stability by repairing the Bankart lesion (a tear in the labrum, the lining of the edge of the socket) and any stretch or rupture in the ligaments of the shoulder capsule. 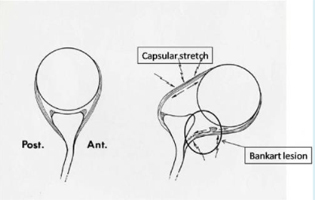 In the majority of cases, this can be performed as an arthroscopic surgeryas seen in the image below. 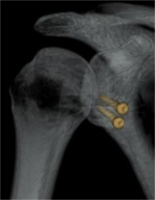 This surgery involves placement of anchors (plastic, metal, or absorbable) into the edge of the glenoid socket. Sutures from these anchors are then placed arthroscopically through the labrum and capsule. The sutures are then tied down, reattaching the labrum and capsule. Latarjet procedure: In the case of loss of bone along the anterior (front) of the glenoid socket, a soft-tissue Bankart repair has a high likelihood of failure. Our approach is to perform an operation called aLatarjet procedure. It involves transfer of a bone (coracoid process) in the front of the shoulder into the front part of the scapula so that it acts to restore the glenoid socket surface. Attached to this bone is a tendon (the conjoined tendon) that acts as a sling in the front of the shoulder.